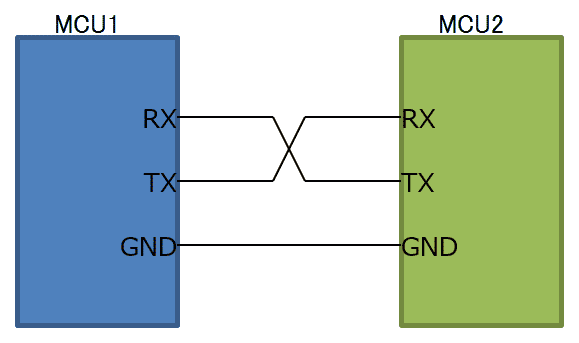 UART is a widely used means to communicate between microcontrollers, or between a microcontroller and a computer. It is necessary to apply same settings both to a transmitter and to a receiver, because it does not have a clock line like SPI, I2C. I am not an electrician, so I was not familiar about UART. However, when I use some equipments by computer, I was sometimes communicating by the RS-232C. Now USB are often used, but some old equipments may require RS-232C communication. Connect RX/TX like the figure. You need level shift if the voltage level is different. There are sometimes another line called CTS, DTS line, but I haven't seen them so far. General UART format is shown below. Initially the signal line is set to "high". When the transmitter intend to start communication, the transmitter set the TX pin to "Low". After that, the transmitter send predefined amount bits, and set back to "high". Sometimes the additional bit called parity bit is added before the end of communication, but it is not often. As mentioned before, you need to set speed and formats before communication started. Items and values are often used are shown below. 2014 Denshikousakusenka All Rights Reserved.